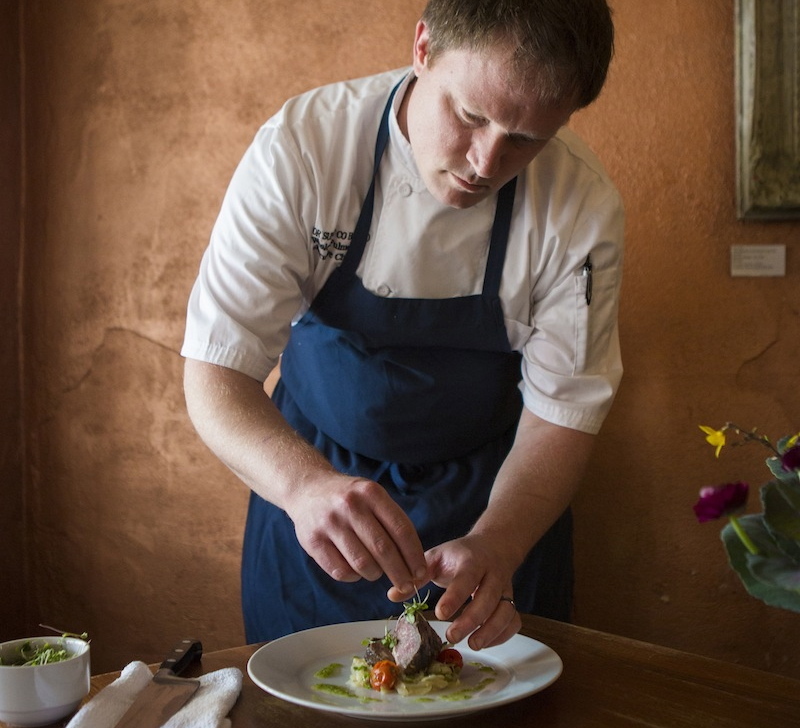 Jan. 8, 2014 (COLUMBIA, S.C.) – Joining notable chefs from Nashville, Louisville and Charleston, Executive Chef Wesley Fulmer of Motor Supply Co. Bistro will represent Columbia, S.C. when he returns to his alma mater, the Kiawah Island Golf Resort near Charleston, S.C., to participate in the 7th annual Gourmet and Grapes gala, Feb. 6-8, 2015. The weekend-long Gourmet and Grapes event benefits Hollings Cancer Center at the Medical University of South Carolina. The weekend-long event will take place at Kiawah Island Golf Resort – home of The Atlantic Room – where Chef Fulmer steered the kitchen under the leadership of Jonathan Banta prior to returning to the Midlands to take the helm at Motor Supply. This will be Chef Fulmer’s first time participating in the cancer research benefit. Notable chefs participating in the prestigious event include fellow initiator in the farm-to-fork movement, Executive Chef Anthony Lamas of Seviche in Louisville, Ky. (an emerging culinary destination much like Columbia); Mike Lata, Chef and Owner of Charleston, S.C.’s FIG and The Ordinary restaurants and Best Chef: Southeast winner of the 2009 James Beard Award; and Tyler Brown, sustainable farmer and Executive Chef at Capitol Grille in Nashville, Tenn. – one of Esquire Magazine's Four New Chefs to Watch in 2011. Curtis Clark, Chef Tournant at Motor Supply Co. Bistro, who also previously worked at Kiawah Island Golf Resort, at The Sanctuary, will join Executive Chef Fulmer at the benefit. Saturday evening’s Wine Odyssey Gala, held at The Sanctuary, encompasses a cocktail hour, silent auction, and culinary meet and greet where guests will have a chance to meet some of the most talented chefs in our region – including Chef Fulmer. Guests will also get to witness the awarding of the coveted 2015 Golden Fork Award. Since Gourmet and Grapes began in 2009, more than $850,000 has been raised for cancer research programs at Hollings Cancer Center. To view the full schedule of events and purchase tickets, visit www.kiawahresort.com/gourmet-grapes.